A major part of Australia’s social cohesion comes down to the sports club. In every community across the country people come together to play their favourite sports, attract visitors to their towns, and even produce the next generation of superstar athletes. “Marketing” doesn’t necessarily mean television and newspaper ads, because that can get expensive and most sports clubs don’t have that kind of money. That doesn’t mean that you can’t do some more grassroots marketing though. Set up a Twitter, Facebook and Instagram account for the sports club, and post photos of events that happen around the club – matches at the oval, training sessions, or anything else that the space might be used for. In addition to bringing some money into the club, sponsors are generally invested in doing some promotional work of their own, so you get the residual benefits of that too. Finding local organisations that can drop some money into a sponsorship is an easy way to build a strong sense of community around your club. Make sure that it’s not just the local newspapers and television networks that know about your club and the schedule. Engage bloggers and social media influencers; if someone in town has a Twitter following of 10,000, for example, then invite them along to the games. Their reach in the local community will not be insignificant. Make sure that you’re constantly engaging with all media via press releases and reminders of upcoming events – emailing them at the start and end of a season is not enough. The budgets that you do have to work with should be invested in making the facilities are comfortable and enjoyable for the audience as possible. Investing in grandstand seating to cover as much as the oval as possible is a good idea; while it might be expensive to cover the entire ground, the more grandstand seating that you do have, the more people can attend and sit comfortably, regardless of their physical condition. Another benefit to grandstand seating is that you can work with a provider such as Felton Industries to come up with a highly customised solution that will provide you with the opportunity to design the seating to match the field itself. When it comes together like that, the perception that the audience will have is that the local sports club is well managed and professional in approach, and that is ultimately a good way of attracting interest from both within the community and wider. 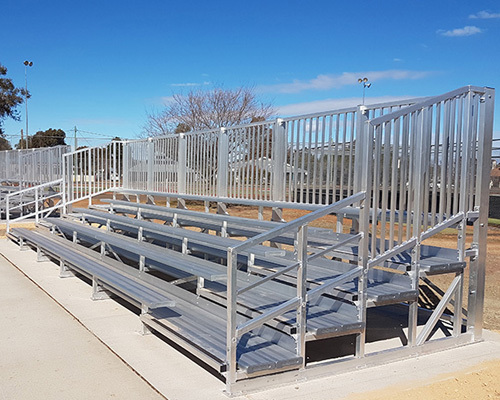 For more information on how Felton Industries have assisted sports clubs across the country with setting up grandstand seating, contact us at 1800 83 40 16.